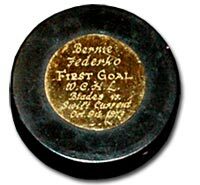 Puck used by Federko to score his first WCHL goal as a member of the Saskatoon Blades on October 9, 1973 against the Swift Current Broncos. 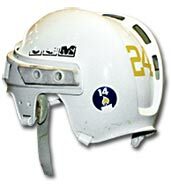 Helmet worn by Ferderko during his final of 13 seasons as a member of the St. Louis Blues in 1988-89. 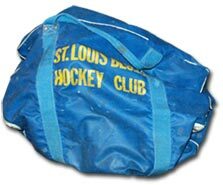 During his first professional season in 1976-77, Bernie Federko used this hockey bag while splitting his time between the St. Louis Blues and the CHL's Kansas City Blues. Federko captured the Ken MacKenzie Trophy as the CHL's Rookie-of-the-Year and was named to the second All-Star Team. 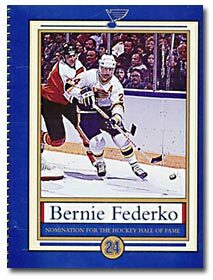 1,000 points on March 19, 1988 versus the Hartford Whalers. 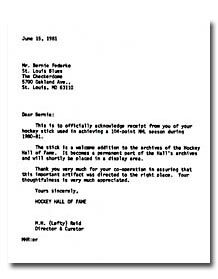 Letter from Hockey Hall of Fame Curator, Lefty Reid to Bernie Federko acknowledging receipt of the stick he used to achieve his 104th point during the 1980-81 NHL season.